"The Inventor Of Poking" doll isn't Zuckerberg, at least officially. He’s one of the world’s youngest billionaires. He’s Time Magazine’s 2010 Man of the Year. He’s everywhere you want to be. He’s Mark Zuckerberg, founder of Facebook, and he’s getting the highest honor an American under 30 can possibly receive. Mark Zuckerber has been made into an action figure. The company behind the Zuckerdoll is MIC, AKA Made In China, a purveyor of fine plastic toys and other assorted gadgets imported from Asia. They’re best-known as the company that produced the Steve Jobs doll (before Apple threatened to sue them). Like the Zuckerdoll, the Jobs doll was an uncanny likeness of Apple’s CEO. It remains to be seen if Zuckerberg has the lack of sense of humor that Jobs displayed in the very same situation with the very same company. Here’s hoping that Zuck has more chuckles. 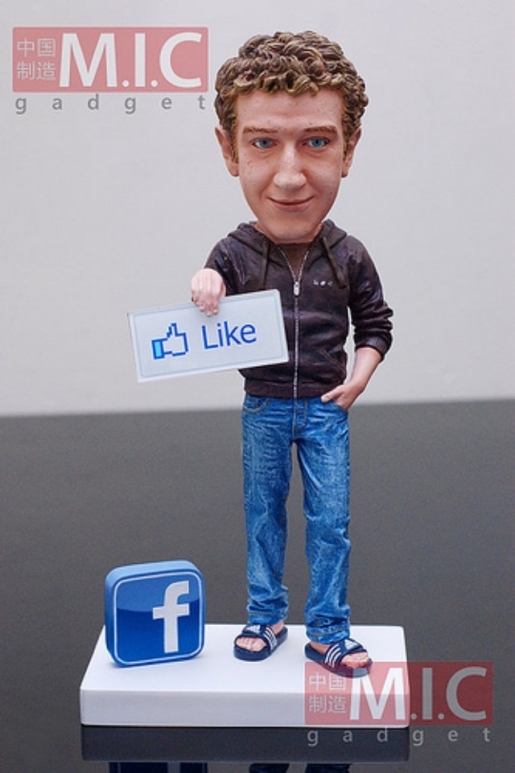 You can pick up your very own Zuckerdoll for $69.90 at MIC Gadget. I have to admit, if that doll wasn’t $70, I’d totally get one. I don’t even LIKE Facebook, but I love toys, and that’s a pretty unique toy to have taking up space on the desktop.